If you remember, we posted something about “Smart Clothes” last week and I was extremely surprised with the way technology is growing, but now… by seeing this, we already grew. 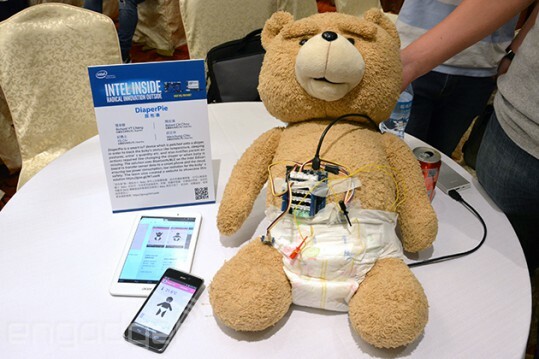 At Computex, Acer Engineers showed off a small sensor module called “Smart Diaper”. It’ll be like a size of a coin and it sits inside any regular normal sized diaper. It is capable of detecting both moisture and methane. It’ll be really helpful for us to track our baby’s temperature and sleeping posture. We can also detect the presence of pee (moisture) and poo (methane) in the diaper. All these data are stored in the app via Bluetooth and Cloud. You’ll also get notifications whenever a baby’s diaper is soiled. You’ll get warning whenever the diaper is getting wet or even when the baby is facing down. As of now, this is not a commercial product yet but hopefully considering the response it got, it could be soon available in the market. We are waiting for this Acer!